Our JO 3-10 athletes are enveloped in gymnastics training on all four Olympic events as well as continued improvement in their strength, flexibility, teamwork, and goal setting skills. Each athlete is required to have their own competition and workout leotards, as well as warm-ups. Our elite coaches are dedicated to work with all of our JO Team athletes to prepare them for local and out-of-state meets. If you’re curious to learn more about our JO Team, call (816) 347-8008 today! There are three teams for athletes, depending on their JO Team Level. Our Xtreme athletes compete in either compulsory or optional exercises. The compulsory routines are developed with varying levels of difficulty so the athletes use the compulsories to develop their skills progressively. Optional routines are choreographed by the gymnast and the coach. Optional routines are usually unique to each particular gymnast while compulsories gymnasts perform pre-choreographed routines that each competitor must execute. Scoring for compulsories and optionals is similar except that the gymnast must follow a prescribed sequence of skills in compulsories. The athletes start with competing at Level 3 and go up to Level 10. Levels 3, 4 and 5 are compulsory levels. Levels 6, 7, 8, 9, and 10 are optional levels. The Elite Level is for athletes beyond level 10. The first JO competitive level is Level 3 . It consists entirely of compulsory routines. Compulsory routines are a pre-choreographed series of skills that each competitor must perform. They are made up of core skills needed for each event, built on the skills from a previous level. The philosophy of these routines is for the athletes to practice toward perfection of these basics. The minimum age for this level is 6. The athletes are arranged in age groups at competitions. Our Level 3 athletes are dedicated to 9-12 hours of practice per week. Levels 4 & 5 are also a compulsory levels of competition. Each level builds on the skills of the previous level and likewise is judged with higher expectations. The USAG structure is based on a progressive "step by step" building of physical, emotional and psychological skills. Proficiency of all aspects of the gymnast at each level is expected and required to insure a safe smooth movement through the levels. The minimum age for this level of competition is 7. These two levels often train together alongside the level 4’s and are dedicated to 12-18 hours per week of practice. 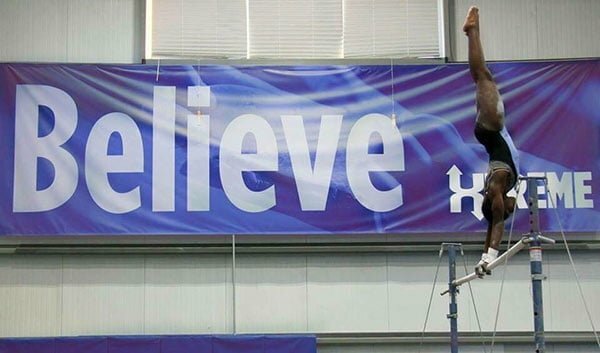 The Junior Olympic Levels 6-10 are dedicated to 16-30 hours a week and are required to compete in meets across the country to prepare for Regional and National Championships. Level 6 and is the first level of all optional competition. Optional competition consists of each gymnast performing her own routines for each event. There are five optional only levels: 6,7,8,9,10. The minimum age for level 6 & 7 is 7 years old, 8 is 8 years old, while for levels 9 and 10, it is 9 years of age. Level 8 is the third level of optional competition. Its difficulty requirements and expectations are accordingly more difficult than at level 7. Reaching Level 8 is a significant achievement for a gymnast. Level 10 is considered a Pre-Elite Level and for the truly dedicated and motivated gymnast. Elite is the 11th level of competition. Like Level 10 it is for the truly dedicated athletes. The Elite level is broken up into 2 categories, NATIONAL and INTERNATIONAL . Children and Jr. National Elites compete in skill testing and optional routines. Jr. International and Sr International compete optional only. It is from the INTERNATIONAL rank that our Olympic and World Championship teams are chosen. Is your student interested in joining our JO Team? Call (816) 347-8008 to schedule an evaluation with our elite coaches today!